ACT is a water extract of compost that is brewed without use of heat. This permits a high growth of beneficial organisms. The addition of food to the ACT assists in the survival of young plant transferred to other soils. Aerobic conditions is presence and growth of beneficial organisms. If the tea becomes anaerobic or low oxygen concentrations, the aerobic organisms will be lost and the subsequent compost tea is also lost. Anaerobic teas cannot provide the benefits discussed below that are possible with aerobic compost teas. Anaerobic teas only provide anaerobic bacteria and yeasts. Anaerobic tea cannot replenish full soil food web and is not a nutrient supplier. And in anaerobic conditions soil structure cannot be maintained. Nutrients are lost through volatilization, because major nutrients are converted to gaseous forms in reduced oxygen, conditions. The smell of ammonia, rotten egg, vinegar, putrid, or sour smells is an indication of anaerobic conditions. A brewed water-extract where nutrients and minerals are added (or from the compost) for the rapid multiplying of organisms resulting in a greater oxygen use than oxygen diffusion into the water. The mixing of bacterial species can have specific beneficial impacts. And the addition of these cultures to compost tea can add specifically desired functions to the tea. Using significant pressure of running water through compost, the organisms and soluble nutrients can be extracted from the solids. Test that salts (e.g., nitrates) are not present in the compost, as high levels can “burn” plant surfaces. Organisms, different kinds of foods, or nutrients are used to improve conditions for beneficial bacterial and fungal growth in compost. Strictly adhere to recommended amounts as excessive additives may result in oxygen consumption to a detrimental level. 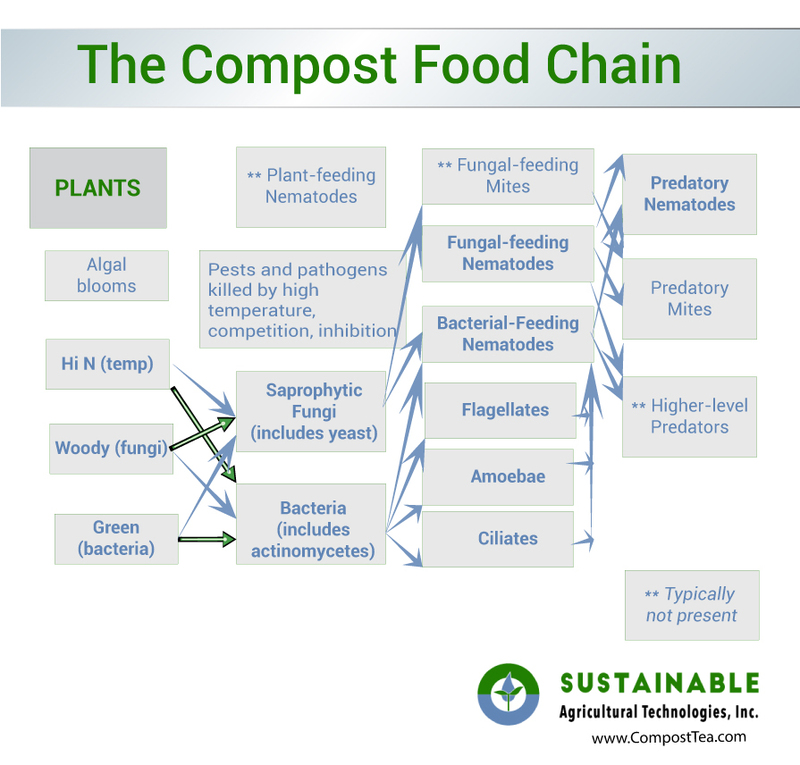 Compost quality refers to the beneficial organisms that out-compete the less or not-beneficial organisms. The soluble nutrients and foods in aerobic compost help make certain the organisms will grow in the tea brewing process. Water may be added to fresh plant materials (e.g., chamomile, horsetail, marigolds, and nettles) to remove plant juices. Plant teas usually do not contain the many beneficial organisms found in compost tea. Nutrients and minerals that the microbes will consume. Manure Tea is the addition of water to animal manure. Non-Mixed Manure Tea: Soluble nutrients will be extracted through the tea. Typically this tea is higher in nitrates, salts, phosphorus, and/or potassium. High numbers of anaerobic bacteria, ciliates, and of nematodes will be extracted through the tea with extremely low fungal biomass. * If antibiotics are used, they can also be extracted into the tea, causing significant impact to the microorganisms. A water extract, brewed tea without aeration. The tea will likely not become anaerobic. Bacteria, fungi, protozoa, nematodes, soluble foods and other plant nutrients. The higher the quality of the compost, the greater will be the number of beneficial species of each group of organisms. Below which aerobic fungi, protozoa and nematodes will be lost and are replaced by anaerobic bacteria and yeasts.